A standard neurological examination should be performed. Normal values expected: In general, laboratory tests are of no significant value other than for standard preoperative studies. Blood should be typed and crossmatched for surgery. Tumor large at presentation: Due to the increased propensity for these tumors to be intraventricular in children, they can reach very large size before becoming symptomatic. Tumor sizes ranging from 2-11 cm have been reported. Edema: Tumor edema is present in approximately one-third of cases. Convexity and ventricle preferred locations in children: In children the most common location for meningiomas is the cerebral convexity (40%), followed by the ventricles (15%), the infratentorial fossa (8%), the brain parenchyma (5%), parasagittal region (4%), and the sella and cavernous sinus (8%) (6). Homogeneous hyperdensity: 62% of cases demonstrate homogeneous hyperdensity of the lesion (6). Calcification: 15% of cases demonstrate calcification (6). Cyst formation: 20% of cases demonstrate cyst formation (6). Hemorrhage: Hemorrhage is rare and is seen only in 1-2% of cases (6). Iso- to hyperintense lesion: Most of the lesions appear isointense in both T1- and T2-weighted images, but some may appear hyperintense on T2-weighted images. 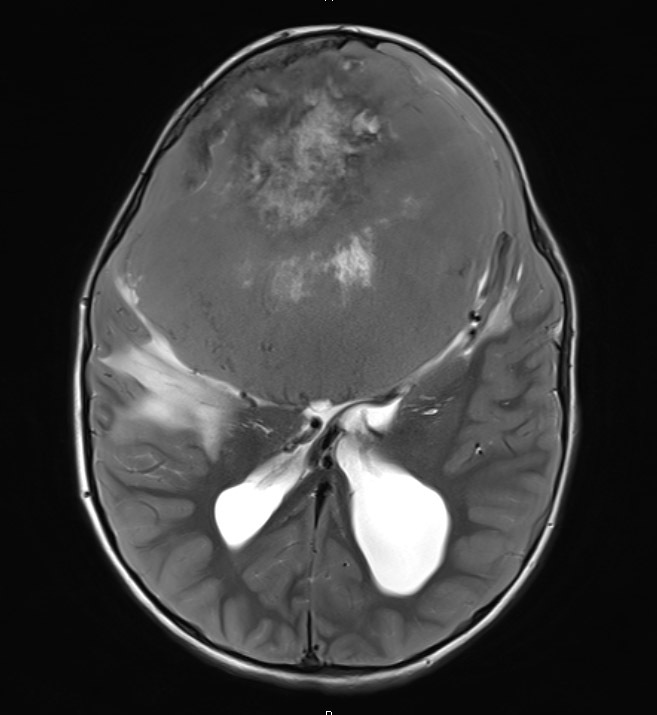 T1-weighted sagittal MRI of a meningioma: This image reveals an olfactory groove meningioma in a 9-year-old girl with NF. 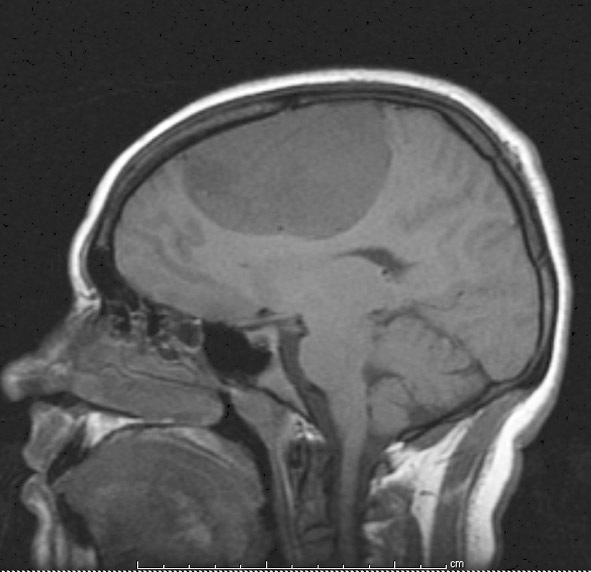 T2-weighted axial MRI of a meningioma: Shown is an olfactory groove meningioma in the same 9-year-old girl with NF. 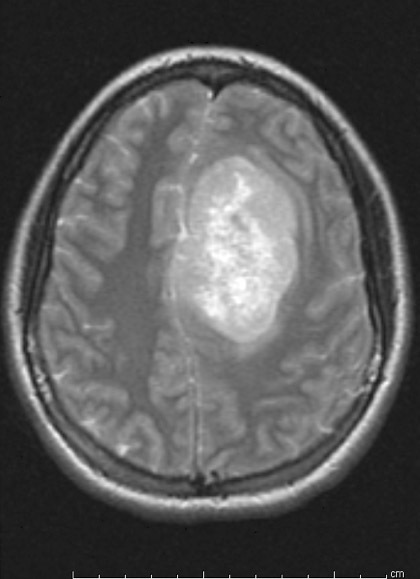 T1-weighted sagittal MRI of a meningioma: This image of a 16-year-old female shows a dural-based extraaxial mass over the left frontal convexity. T2-weighted axial MRI of a meningioma: This image of a 16 year-old female showing a dural based extraaxial mass over the left frontal convexity. Bright enhancement after gadolinium: The enhancement is usually homogeneous but may be nonhomogeneous. T1-weighted post-gadolinium coronal MRI of a meningioma: Shown is a 16-year-old female’s image of a dural-based extraaxial mass over the left frontal convexity with diffuse enhancement. 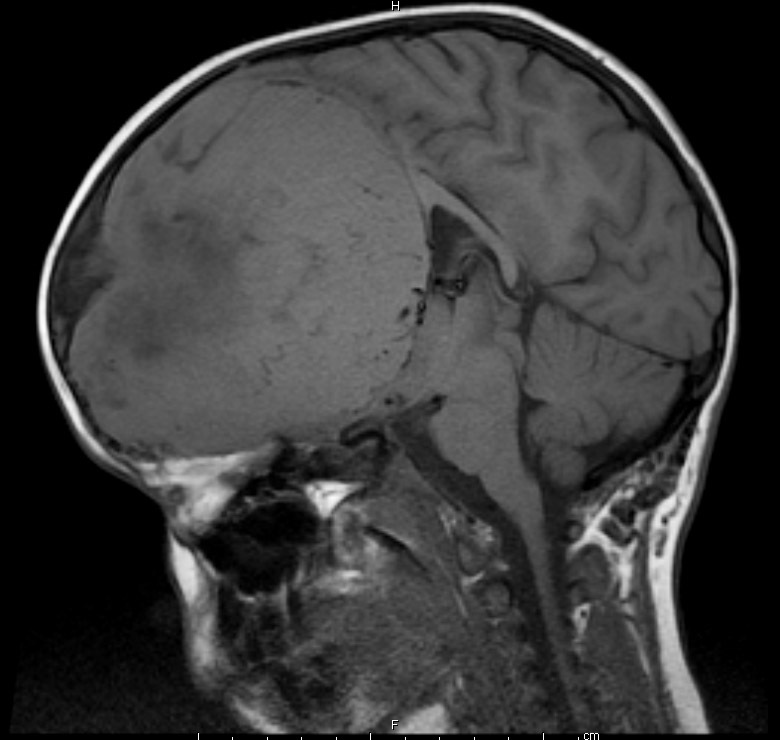 T1-weighted post-gadolinium MRI of a meningioma: This image shows strong enhancement of an olfactory groove meningioma in a 9-year-old girl with NF. Functional MRI: A fMRI may be useful in operative planning, depending on tumor location. 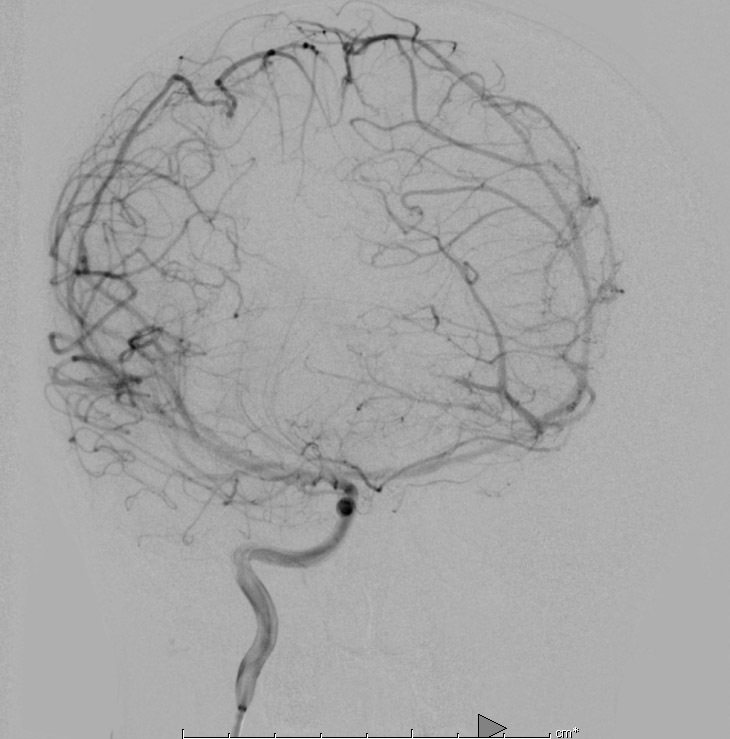 Embolization: Angiography is generally not performed for characteristic lesions, with the exception of needing to establish vascular involvement or encasement of vessels, and to perform embolization of feeding meningeal vessels. 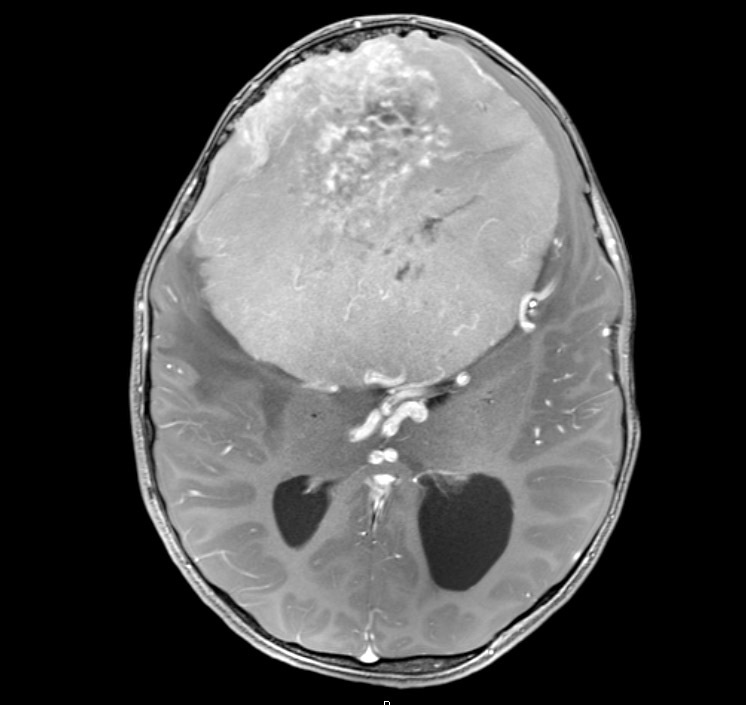 Right Internal Carotid injection showing a meningioma: This image was done on a 9-year-old with an olfactory groove meningioma. It shows intense vascularity and splaying of arteries at carotid bifurcation. Nuclear medicine tests have no specific application in the diagnosis of meningioma. Electrodiagnostic tests have no specific application in the diagnosis of meningioma, unless there is associated seizure disorder. Neuropsychological tests have no specific application in the diagnosis of meningioma. In general, MRI is an adequate test for deciding on diagnosis and treatment plan. Angiography can be utilized if it is felt that embolization would be a helpful adjunct to surgery. EEG is an adjunct only when seizures are a prevalent component of the presentation.